Americans are ready for their first female president, Bill Clinton said during his visit to the Faeroe Islands. Clinton, whose wife, Hillary Rodham Clinton, is seeking the Democratic nomination for the U.S. presidency, gave her a plug during his one-day visit to the wind-swept islands located halfway between Iceland and Norway. "No one has voted yet but I think she has a good chance," Clinton told reporters. 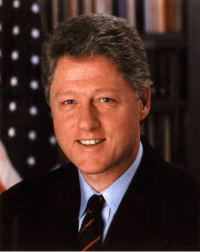 Asked whether he believed the United States was ready for a woman president, Clinton replied, "I think so. Hillary is the right one, and I think the American people are ready." Clinton was appearing with former U.N. weapons inspector Hans Blix later Monday to address some 500 Faeroese business leaders. Both were to speak in Copenhagen on Tuesday. Earlier, Clinton strolled through the capital, shopping, stopping for coffee and shaking hands with residents. Clinton, who has said his mother descended from an 18th-century Northern Ireland farming family, said he found the Faeroes interesting because the archipelago's first settlers are believed to have been Irish monks. It was the first time that a former U.S. president visited the 18-island archipelago halfway between Iceland and Norway. The 18-island archipelago is now a semiautonomous Danish territory.